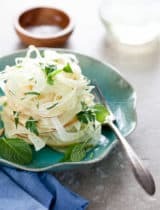 A light and refreshing slaw-like celery, cucumber and fennel salad with lots of fresh spring herbs served on a bed of creamy almond cheese spread. 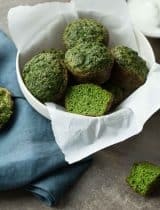 Now that winter is finally behind us, I find myself craving all things green and fresh. That means more herbs and lots of salads (the crisper and crunchier the better). 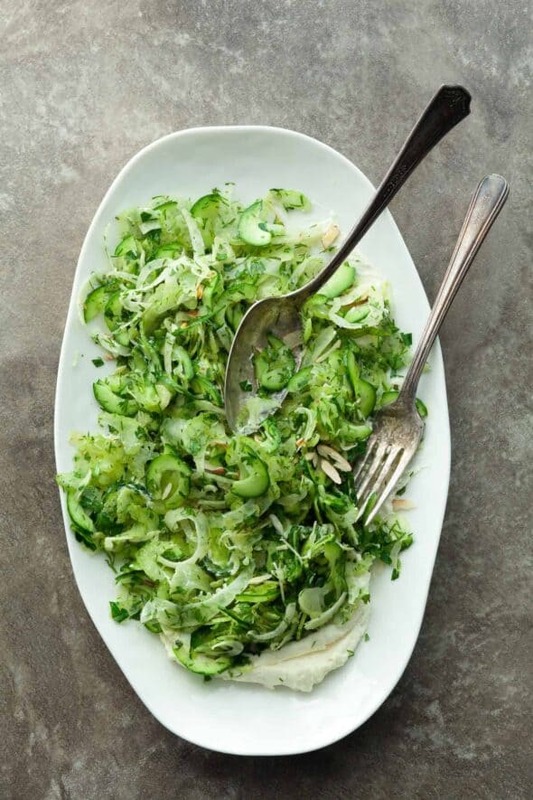 This herby cucumber, celery and fennel salad is one I make often. 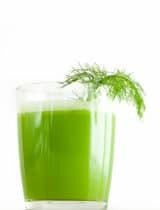 It’s clean, fresh taste embodies the lightness of springtime that I’ve been hungering for. Alone the ingredients sound more like an assortment for a vegetable platter than a salad, but shaved paper-thin and tossed with loads of fresh herbs, a bit of olive oil and a pinch of salt, they transform into something altogether different and more enticing than the sum of their parts. Preparing the salad involves a bit of slicing on a mandoline and blending, but beyond that is fairly simple to pull together. 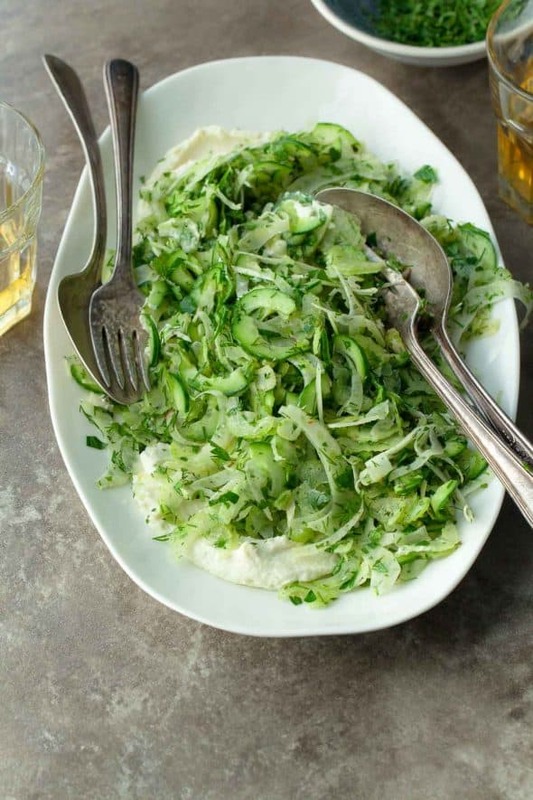 Using a mandoline to create super-thin slices gives the salad a slaw-like consistency and an elegant presentation, but also tenderizes the vegetables and ensures that every bite is coated with fresh spring herbs like dill, parsley and mint. 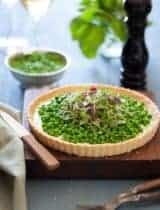 I like to layer the dressed salad over a bed of creamy almond “cheese” spread (if you don’t want to make your own you can always use a store bought one) both for appearance and textural contrast . 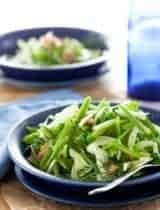 The crunch of the thinly sliced vegetables paired with the creaminess of the almond spread is really quite nice; light and refreshing, but also creamy and flavorful. 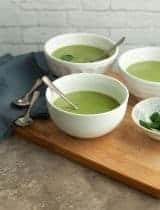 The crispness and crunch of the cucumber, celery and fennel is tempered by the richness of the olive oil and almonds and accentuated with a touch of salt. 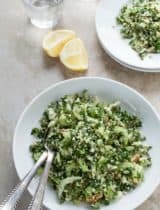 And because you can prepare all the parts ahead of time and assemble when needed, this salad makes a great addition to a spring brunch, lunch or picnic. Bring a small saucepan of water to a boil. Add the almonds to the boiling water, turn off heat, cover and let sit for 15-20 minutes. Drain in a colander. Remove the almond peels by squeezing each almond firmly at the base between your thumb and index finger until the skin pops off. Add peeled almonds and the rest of the ingredients to a small blender or food processor and process until smooth. (Scrape down the sides of the bowl and adding more water as needed.) Taste and adjust seasoning. Cover and chill until needed. Thinly slice the cucumbers, celery and fennel on a mandoline or with a very sharp knife. 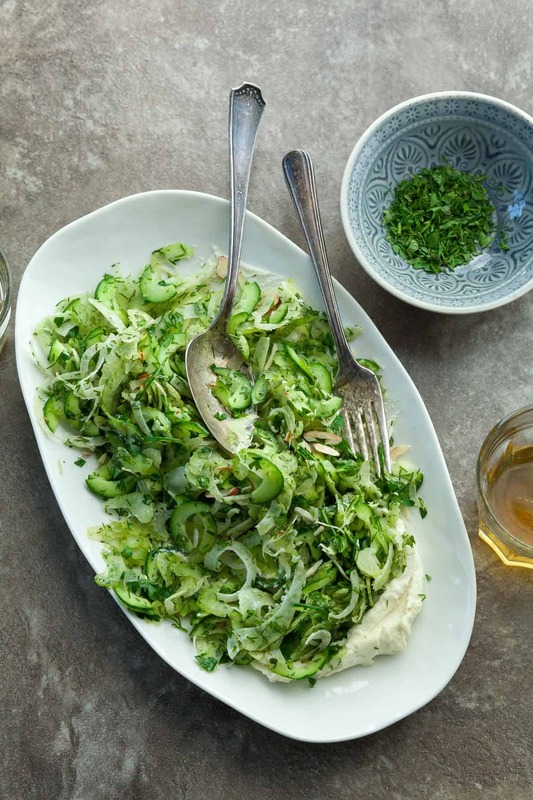 Toss together shaved cucumber, celery and fennel with chopped parsley, dill, mint, olive oil, lime zest and lime juice in a large bowl. Season with salt and pepper. 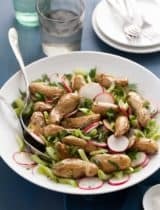 Spread almond cheese onto plate and top with a mound of shaved vegetables, top with sliced almonds and an extra pinch of sea salt if desired.